I don't believe in breakfasts that take more than 20 minutes to make. When I wake up in the morning, I am HANGRY. I need a tall glass of water and some calories ASAP, or the rest of my day goes to hell. Which is why these chocolate rolls are absolutely perfect. Nope, I didn't spend the morning folding croissant dough together, no, no, no. Feel free to experiment with different flavors and combinations. 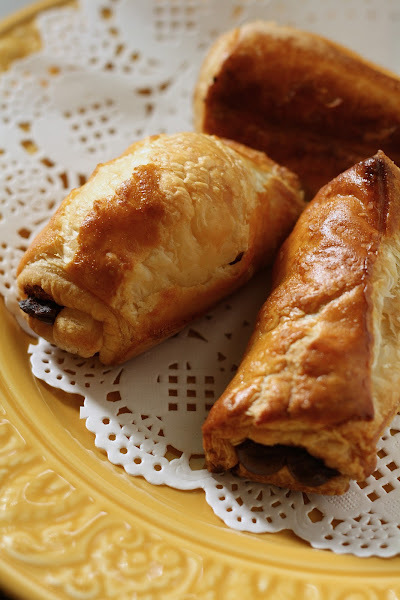 Throw in a dash of cinnamon in each roll for Mexican chocolate croissants. Some lavender flowers or Earl Grey tea leaves to bring a floral scent to the dark chocolate. Or, use white chocolate chips and chopped up macademia nuts for an original breakfast roll. Personally, I'm not that creative in the mornings. 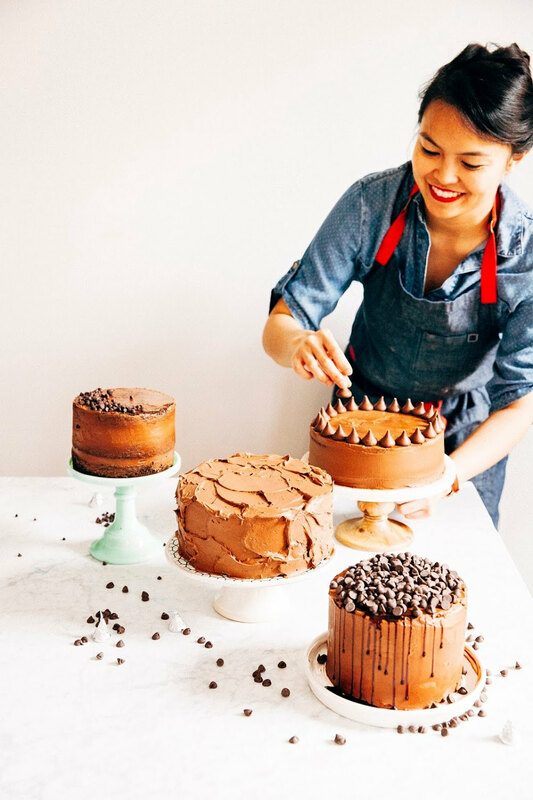 Just give me a buttery, flakey crust filled with dark chocolate and I'm a happy girl. 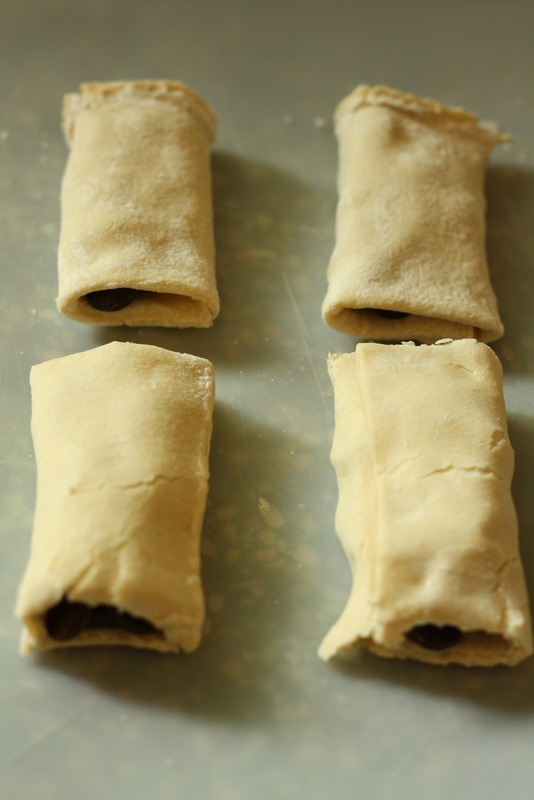 Cut your thawed puff pastry into 6 x 3 inch rectangles. 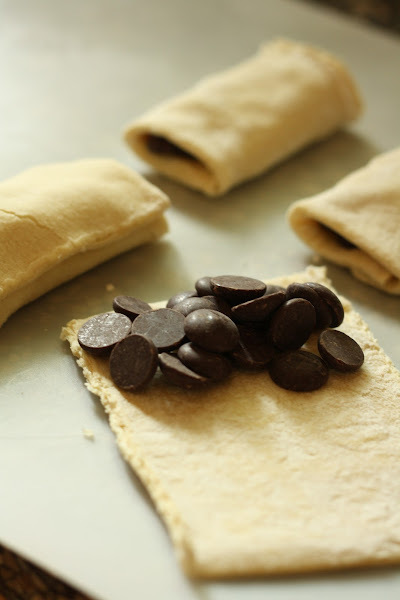 Add chocolate in one half of the rectangle, forming two lines with the chocolate chips. 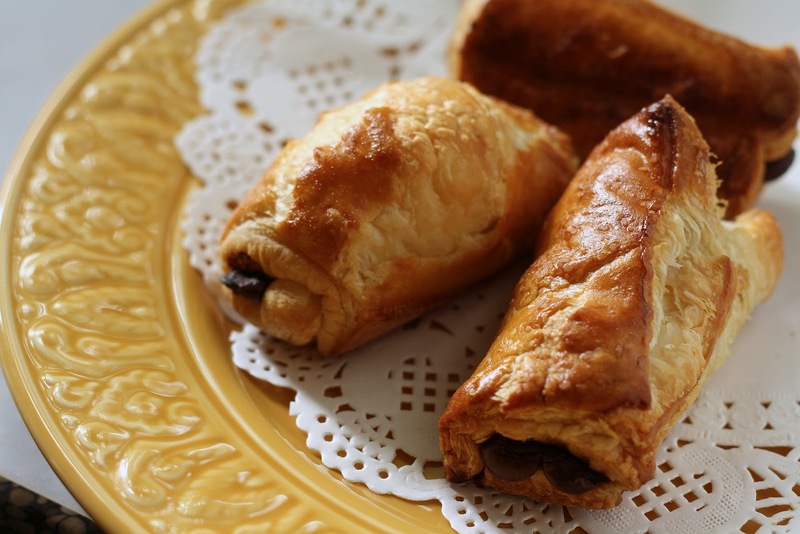 Fold the side of the puff pastry over the half containing the chocolate, and flip the roll so that the seam is on the bottom facing the pan. If you leave the seam up, the puff pastry will burst open and you'll end up with a pastry that looks more like a gallette than a roll. In a small bowl, whisk together 1 egg and 1 tablespoon of water. Use a pastry brush to brush the beaten egg and water mixture on top of the rolls. Sprinkle with a dash of sea salt. Bake in the preheated oven for 20 minutes, or, until puffed and golden. The rolls should have doubled in size during the baking process. When ready, cool for 5-10 minutes on a cooling rack and serve immediately -- the rolls are best when served fresh. Enjoy! I have yet to try this, let alone this existed prior to me reading about it. I think this will be very amenable with Hershey's syrup. 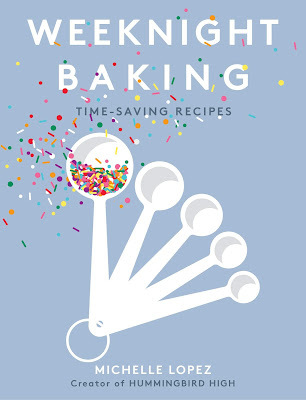 I hope to accomplish this batches with my current cupcake courses. I just tried this with a few modifications. I added a bit of demara sugar for the top as well as the sea salt. In addition, I made a simple sugar glaze with raspberry extract to drizzle over the top. All in all an excellent recipe. I like that idea of the Raspberry extract. I was thinking maybe a little bit of mint mixed with the chocolate and a little of JD Whisky extract and a dash of honey and red chilly. And last but not least your raspberry extract with some pieces of boiled strawberry glazed on it. Will try it out for sure and let you know what happens. I can taste it right now. 7 flavors in one bite but it shouldn't be heavy in the tummy. Exciting it is and like you said All in All an excellent recipe. I'm trying it right now! I usually have puff pastry but instead I am using generic crescent rolls and instead of dividing to triangles kept them as squares. I added a lil butter to the inside and chopped up the only chocolate I have (100%) cacao. Lets hope for the best on this near midnight snackaroo.